(NaturalNews) About one-third of the human diet comes from plants that rely on insect pollinators. Honeybees especially seem to be of great importance. They are responsible for pollinating 80 percent of our crops. For years, we have seen a vast decline in honeybee numbers, putting our food chain at great risk. The main culprit seems to be the extensive use of a specific class of pesticides known as neonicotinoids, or neonics for short. While major neonic producers, such as Bayer CropScience and Syngenta, claim that neonic effects on bee populations are exaggerated, Ortho, a top US manufacturer of lawn and garden pesticides, doesn't quite agree with them there. Ortho, a division of Marysville, Ohio-based Scotts Miracle-Gro Co, has just announced that it will phase out the use of neonic ingredients imidacloprid, clothianidin and dinotefuran by 2017, and will further take action to reform eight of their products used to kill garden pests by the year 2021. 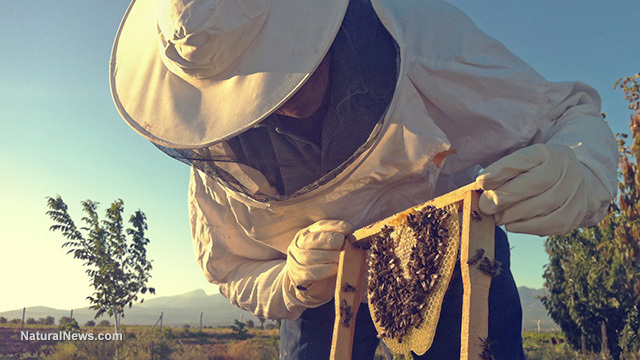 "This decision comes after careful consideration regarding the range of possible threats to honey bees and other pollinators," Tim Martin, Ortho's vice president and general manager, said in a statement. "While agencies in the United States are still evaluating the overall impact of neonics on pollinator populations, it's time for Ortho to move on. As the category leader, it is our responsibility to provide consumers with effective solutions that they know are safe for their family and the environment when used as directed. We encourage other companies and brands in the consumer pest control category to follow our lead," said Martin. While regulatory agencies in the US are still assessing the risk, the evidence is clear, and environmentalists are calling on the US Environmental Protection Agency (EPA) to join the European Commission in adopting a moratorium on these types of insecticides. Research has shown neonics to be responsible for a biological reaction in bees that has been blamed for Colony Collapse Disord0er (CCD). Bees become addicted to the nicotine-like pesticides in the same way that people get addicted to cigarettes. They specifically seek out the pesticide-treated plants to get their fix. It harms their central nervous system, interferes with their ability to get back to the hive, and when the exposure to the residue is great enough, they just overdose on the spot. Ortho's announcement comes on the heels of other actions taken by companies, states and countries that clearly see something needs to be done in order to protect our food chain. Recently, Aldi Sud, a German supermarket chain with stores in the US, has announced a ban of neonics in Europe. France is taking action, too. Lawmakers recently approved plans for a total ban on bee-killing chemicals that goes far beyond the already existing restrictions of the European Union. In March, the US Fish and Wildlife Service said it will consider adding two species of wild bumblebees to the Endangered Species Act. And Maryland in the U.S. may become the first state to ban the sale of neonicotinoids. The Maryland House and Senate already agreed to the proposal and passed a final version of the Maryland Pollinator Protection Act to the desk of Maryland Governor Larry Hogan. According to May Berenbaum, a bee expert, and professor of entomology at the University of Illinois, the introduction of alternatives to neonics is important, but the fight is far from over. "There are still profound problems (for bees), but this is a step toward removing one contributor to some of the problems," she said, as reported by ABC News. Furthermore, she cautioned that the replacement of pesticides could bring a host of new problems, too. "This is not the end. This is no time for complacency," she said.